Enjoy a visit to Vienna in this sunny and cosy apartment overlooking the botanical gardens of Sch�nbrunn. Located directly in front of a side entrance to Sch�nbrunn, you can take a leisurely stroll or early morning jog at the worlds oldest zoo, visit the Emperor�s summer palace and enjoy a breathtaking view of the city from the Gloriette. This spacious one-bedroom apartment also offers a sleeping possibility for two on a pull-out bed sofa. Fully equipped with TV, washing machine, iron and other commodities it offers the perfect comfort for an extended stay. 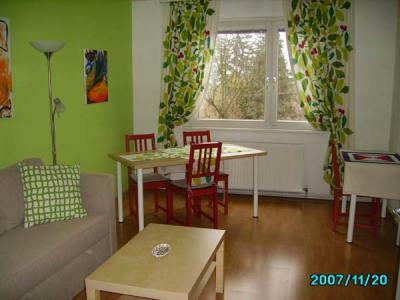 Enjoy privacy and feel like home just minutes away from Vienna�s sightseeing hotspots. Take only a five minute walk to the U4 Hietzing subway station and reach the center of town in less than fifteen minutes.